Canada's women's soccer team took control of its fate at the Olympic tournament on Tuesday in Newcastle, rallying behind a pair of goals by Melissa Tancredi for a 2-2 draw with Sweden in their final group-stage match to advance to the quarter-finals. 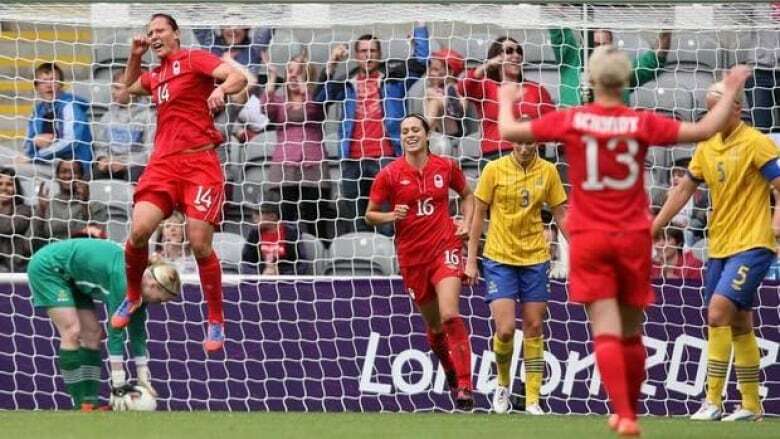 Canada's women's soccer team took control of its fate at the Olympic tournament on Tuesday in Newcastle, rallying behind a pair of goals by Melissa Tancredi for a 2-2 draw with Sweden in their final group stage match to clinch a spot in the quarter-finals. Tancredi, a forward from Ancaster, Ont., leads all scorers in the women’s tournament with four goals, and has tallied in each of Canada’s three matches. The Canadians (1-1-1) finished third in their group, behind Sweden and Japan, but clinched one of the two wild-card berths in the knockout round of eight. In Friday's quarter-finals, Canada will face Great Britain, which defeated Brazil 1-0 on Tuesday to finish 3-0-0 and atop Group E.
"Everyone in this tournament is beatable," Canada midfielder Kaylyn Kyle said. "To be the best, you have got to beat they best and they are the best for a reason." The other quarter-final matches pit the United States against New Zealand, Sweden against France, and Brazil against Japan. Canada started the game in an aggressive fashion, pressuring the highly touted Swedish defence — which held the defending World Cup champion Japanese team to a 0-0 draw on Saturday — with several quality opportunities. Those started in the sixth minute when Canadian captain Christine Sinclair sent a rising cross into the Swedish box that Tancredi couldn't finish off. Seemingly on their heels with chance after chance by the pressing Canadians buzzing their goal, Sweden soon had a stranglehold on the match — making good on the their first two chances of the game. Marie Hammarstrom deflected a sharp cross past Canadian goalkeeper Erin McLeod in the 14th minute, and just two minutes later Sofia Jakobsson beat a sprawled McLeod to hand Canada a quick 2-0 deficit. As a see-saw first half wound down, Tancredi crushed a cross past Swedish goalkeeper Hedvig Lindahl in the 43rd minute to give Canada a lift heading into the break. Tancredi struck again in the 84th minute off a Sinclair pass to draw the Canadians level with Sweden, booking their spot in the quarters as the top third-place team in the tournament. "I saw Christine making eye contact and I knew she was going to chip it in for me, so I put my body on the line and dived to put my head on it," Tancredi said. In other Group F action, Japan and South Africa battled to a scoreless draw, giving top spot in the group to Sweden, based on goal differential. Meanwhile, in Manchester, the U.S. wrapped up top spot in Group G with a 1-0 win over North Korea. Abby Wambach scored her 141st international goal and third of the tournament in the 25th minute. The Americans were already assured a spot in the knockout stage by virtue of their two wins before the match against North Korea. France also advanced out of Group G with a 1-0 result against Colombia. In Group E, New Zealand joined Great Britain in the knockout stage by beating Cameroon 3-1 to clinch the second wild-card spot behind Canada.